The field workshop dedicated to entomological surveillance and vector control was held in Montpellier from October 2nd to 4th, 2018. 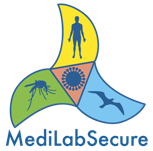 16 participants from 13 different countries of the MediLabSecure network were welcomed for 3 days to visit the facilities, to take note of the research activities in medical entomology that are conducted at IRD, Montpellier and to discover mosquito surveillance in the South of France with EID Méditerranée, through site and field visits, presentations and discussions. The objective was to have a global overview of research activities and vector surveillance and control in the region, illustrated with concrete actions and operational plans that could inspire local strategies or be duplicated. The topics were as diverse as the aerial and terrestrial treatments for mosquito control through drones or trucks, operational tools used to map the mosquito dynamics, and preventive strategies for a social mobilization around vector control. The heterogeneity of the participants’ fields of expertise (3 working groups tookpart in the workshop: medical entomology, animal virology and public health) as well as their own country specific situations contributed greatly to the interactions within the group. Agenda of the workshop is available here.